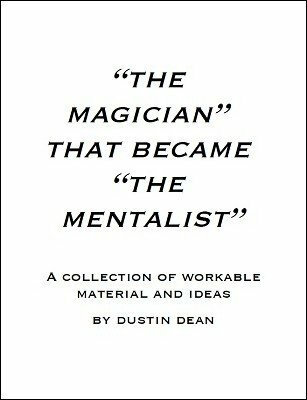 The Magician That Became The Mentalist , is a collection of workable material and ideas that I have created over the past few years. I share with you some of my most used, original routines that I use in the real world. I also share some of my thoughts on mentalism and magic. This includes the importance of performance, dual reality, simplicity, and much more. In this ebook you'll find useful effects and advice, whether you are a magician, mentalist, or in between! I even share a new principle never before seen in mentalism or magic. A principle I named the "WatchStop" principle that can be adapted to fit your own routines. Whether you are a newcomer to magic/mentalism, or a seasoned pro, I'm sure there is material for everyone to enjoy within these pages! QuICk: A marked coin is found within the fibers of a selected playing card. This mixes some magic with some mentalism principles to create an unbelievable miracle. Sneaky Peeky: A devious utility move used to read the minds of two spectators at once using only a deck of playing cards. Dual Fiction: Two participants' minds are mentally connected. After being fully in sync, They both find their thought of playing cards in a borrowed, shuffled deck! Impromptu and gimmicked version taught. (Gimmicks not included). The Gambling Mentalist: After a participant is able to use their intuition to divine the thoughts of the mentalist (a wonderful prop-less introduction in which the spectator guesses your thought of card! ), they are able to take it a step further and randomly select a playing card that ends up completing the mentalist's winning poker hand. Training Wheels: A beautiful stage piece using a pendulum that allows for great theater. The mentalist is able to divine a specific memory of a volunteer by contacting the subconscious mind! I.C.A.A.N.T. Even: A stage or parlor ACAAN that seemingly meets most, if not all of the conditions for the "holy grail." A deck is given to a random volunteer and told to keep this deck guarded! Twenty or so members of the audience randomly generate both a card and a number. The cards are dealt face up by the volunteer and the selected card is found at the selected number! You could even have three cards and three numbers selected, all found in the correct positions! Never touched by the performer, audience members truly make free and random choices, and no memorization whatsoever. This uses a classic mentalism prop which can be made at home. 1st edition 2015, 81 pages with pictures.